This pattern is actually from 1944, which is a little late for Nanea’s time, but similar versions of what makes it unique (the pointy yoke) can be found in commercial patterns from both earlier and later. This one seems to only have been available in sizes for toddlers. That’s not necessarily a bad thing, because I feel AG bodies are very well suited to those styles, but if you want to make something similar for a smaller size doll, check out this post which has something similar but a little easier for Sasha and Hearts for Hearts sizes. Click here for the patterns! These are based on this one by Simplicity from 1956 and the rest will be coming shortly! So the poll was overwhelmingly (>60%) in favor of more stuff for the Wellies and I’ve put together a bunch of really cute things that are in progress for them – stay tuned! Which might mean you will have to make a hard decision whether to use your TRU coupons on something besides the Journey Girls! Enough people still wanted April that I will keep posting some stuff for her, probably once a month, but will discontinue her journal and just maybe post a little summary of the “back story” for that month’s outfit/craft if necessary. I really didn’t intend to get Melody… My doll collection is quite diverse, but my darkest-skinned dolls don’t always make it onto the blog for their own protection. I often find the pictures come out better with a fill-in flash or extra bright lighting/sunshine and as you may be aware, a camera flash and UV rays can be VERY damaging to your dolls’ plastic. However, when I saw pix of Melody in her Christmas dress, I fell in love. 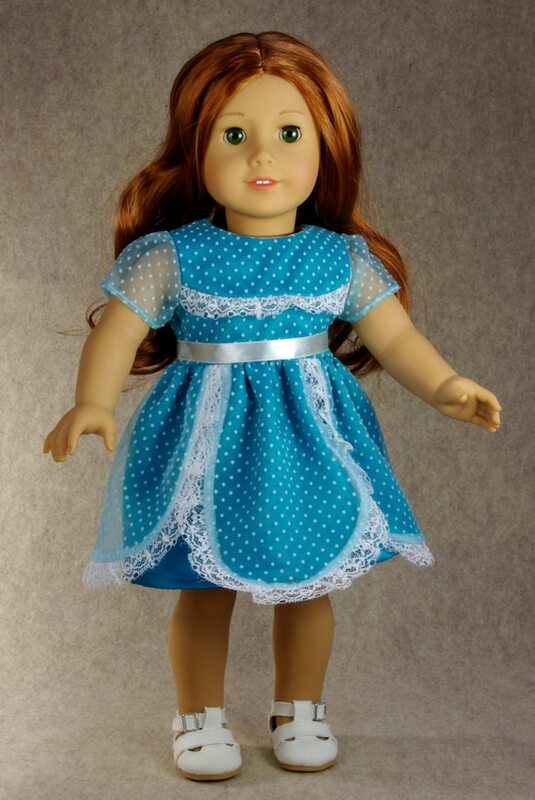 It’s funny how a different dress can make a doll look so different! I had every intention of buying the dress too, but up close the fabric looked cheap and I couldn’t bring myself to fork over $34 for it, especially when I could tell you’d only need about a fat quarter of fabric ($1-$2.50) to make it. So I did buy her the AG sparkly party shoes and made the dress myself. You can too! This dress is technically intended to be her Christmas dress, but is so basic you can make it appropriate for any season or occasion by changing the fabric and altering sleeve length! If you’re looking for the perfect fabric, the one pictured here is from the “buttercream” collection at Joann. 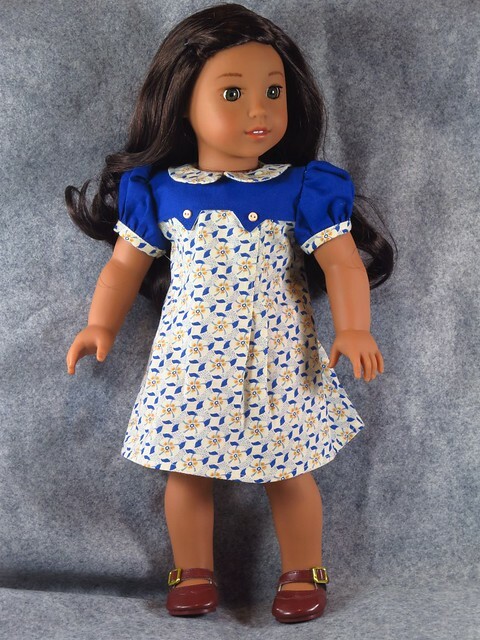 Someone sent me a link last summer to a pic of this dress, which had been “leaked” on ebay before we even had confirmation that it was Melody’s or knew what she would look like, asking if it might become a pattern. Apparently it’s becoming a “thing” for pieces to…let’s say, “go missing” from AG’s Chinese manufacturers and show up on ebay well before they’re officially released. All of Lea’s stuff was also find-able on ebay before she had been released, and various blogs seize this info and post it to give us sneak peeks. On the one hand, I really appreciate this, because I’m always eager to see new AG releases, but on the other hand it also means the picture quality is sometimes poor and it’s possible to not appreciate the clothes and dismiss the collection as something you don’t want before you’ve even seen it in professional photos or in person. 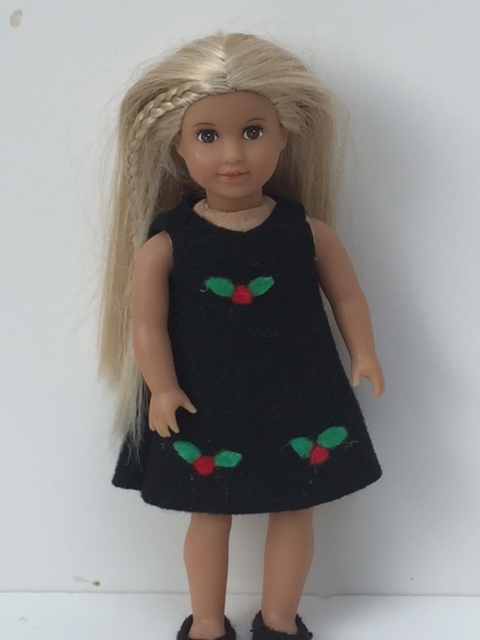 Anyway, I fell in love with the mystery doll’s peplum dress and spent a really long time getting the skirt to look perfect, scanned my final pieces and forgot about it. Now that Melody has come to live with us, I think it looks great on her! The style is a little mature, but in the first book it’s referred to as a dress that her older sister outgrew, so then the look makes sense for a girl her age. April snowstorms bring…May flower dresses! Thank you everyone for your condolences about Jasper! 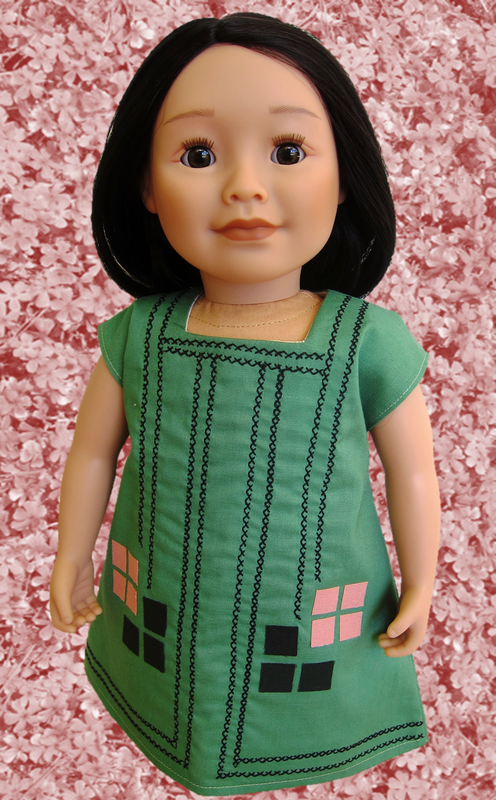 It’s a slim fit on an OG with a flush closure in back, looks great on Journey Girls and will fit the newer KnC dolls more loosely if closed with an overlap in back. It will likely work for Sasha copied at 80%, but make a muslin first to check. Have an older/bigger AG? See the end of the pattern here: https://jenwrenne.wordpress.com/2012/08/17/august-free-pattern-for-kidz-n-cats-and-sasha/ for a tutorial on adding some width at the back with buttoned closures. Oh no, the last Chatty Pattern? I bet some of you want the CC series to just keep going, but there’s lots of fun modern stuff on the way for those that didn’t! 🙂 I actually did a few more things for Cathy, namely her “Nursery School” and “Sunday Visit” dresses. This week’s free pattern is based on a paper doll, but the pattern was so similar to a vintage commercial pattern, I just used it instead, omitting the tucks down the front. Neckline of blouse and jumper are faced with bias. You might want to make the hem deeper for AGs to get the same look. 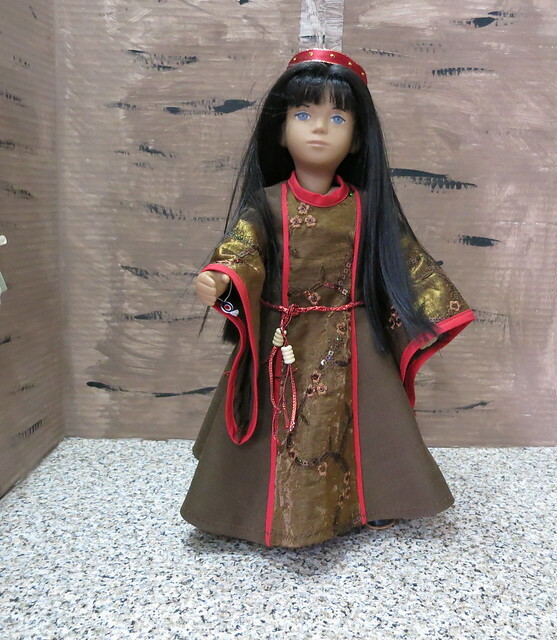 So, as a website which has a rather large archive of my own doll patterns, I’m uploading these pieces for you here free for the purpose of preserving them, since the paper is aging rapidly. You can download them for purposes of research/scholarship, (i.e. learning to sew a historical garment) but despite what some ebay sellers would have you believe, it’s probably not legal for you to reproduce this pattern and sell since the law also states “the reproduction or distribution” must be “made without any purpose of direct or indirect commercial advantage”. Spring is my favorite season of the year! The birds singing, the snow melting, and colorful bulbs pushing up through last year’s leaves make it a magical time. It might even BE spring where you live, but where I live we apparently have a few more months to wait. 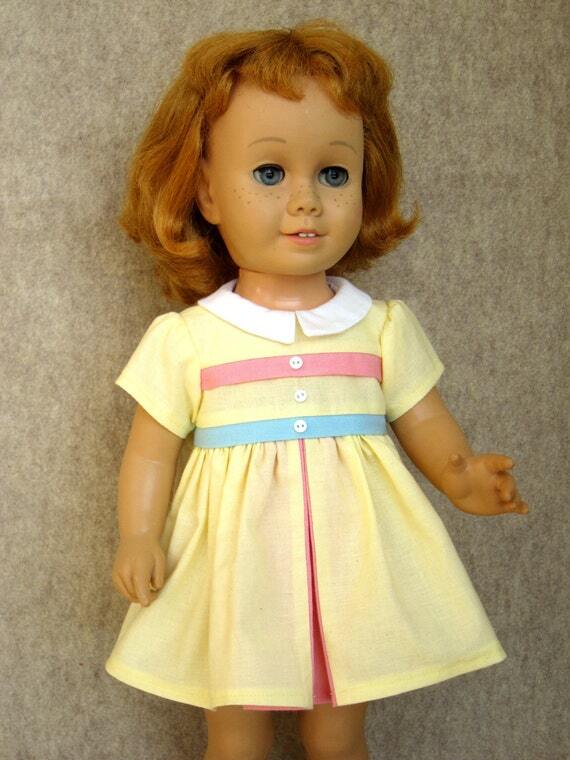 And what better way to wait than sewing a dress your dolls can jump into as soon as those crocuses come up? It’s based on a Bleuette dress from May, 1933, and has been resized to fit Maplelea/AG. What originally attracted me to it was the lovely cross stitch motifs, but it’s a nice, basic pattern that could work for a lot of modern outfits too! Make it in T-shirt fabric, iron on a glittery motif and wear with leggings. Find a fabulous print and take it to the next level with ruffles/ribbon/rickrack. More ideas are in the pattern. She added a few touches to turn the felted slippers into little mice! Have you seen the new BeForever limited edition sets?